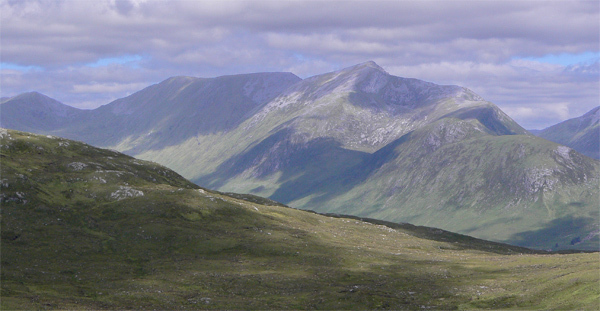 Sgurr a' Chaorachain is the central and highest of a group of three mountains at the W end of Loch Monar. The summit lies at the intersection of three ridges. 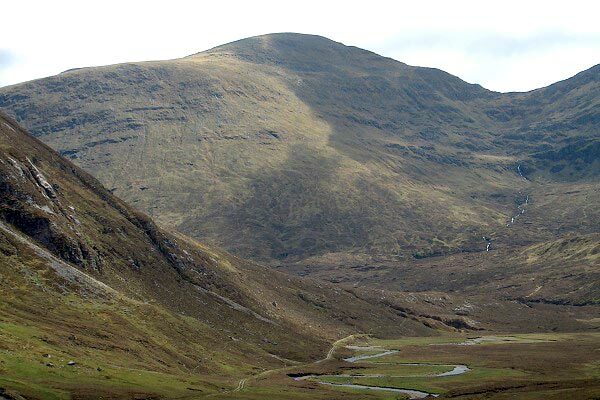 The longest ridge runs N turning NE around Lochan Gaineamhach and down to Glenuaig Lodge. To the W a short narrow ridge connects to Sgurr Choinnich via a high col, and to the E a longer winding ridge connects to Bidean an Eoin Deirg (1046m, but not a Munro). 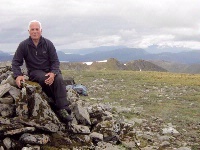 Slopes are generally moderate to steep but there are easier slopes leading to the summit. Bidean an Eoin Deirg and Sgurr a' Chaorachain from the bealach between Moruisg and Sgurr nan Ceannaichean. Sgurr a' Chaorachain seen up Glen Uaig from below the west face of Sgurr nan Ceannaichean. Sgurr a Chaorachain as seen from Bidean an Eoin Deirg (East top) - 10th July 2010. Sgurr a' Chaorachain and Bidean an Eoin Deirg from the south-east; 14th June 2007. 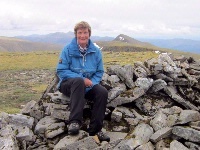 The summary information of one or more ascent routes that include Sgurr a' Chaorachain [Monar]. 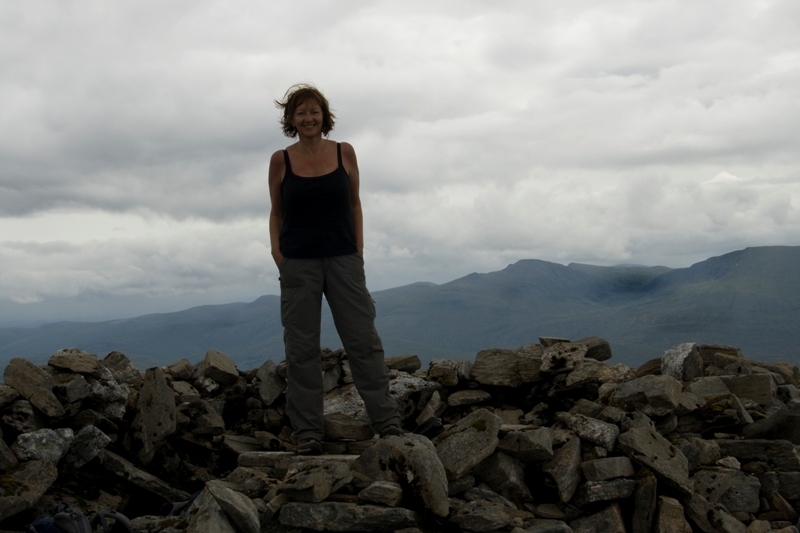 Lynda at summit Sgurr a Chaorachain - 10th July 2010. Scott at summit Sgurr a Chaorachain - 10th July 2010. 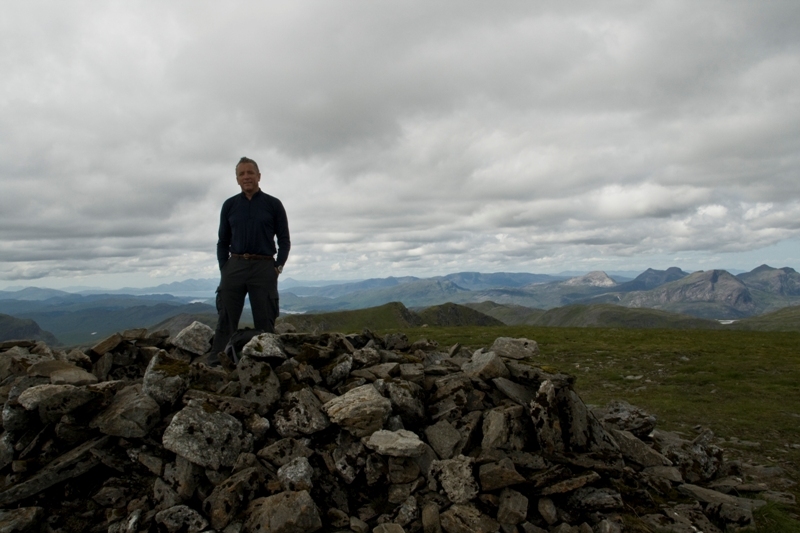 Post a few words about Sgurr a' Chaorachain [Monar] or read what others have had to say. Sgurr a' Chaorachain is another straightforward ascent and took approx 45 mins from the summit of Sgurr Choinnich. From here we continued to Maoile Lunndaidh by dropping down the Drochaid Mhuillich and up onto Carn nam Fiaclan. The distance is quite long and takes a lot after having already done a considerable amount of walking. Another option is Chaorachain's east top - Bidean an Eoin Deirg which for me appearance wise is the finest of this grouping of hills; we did not climb it though. 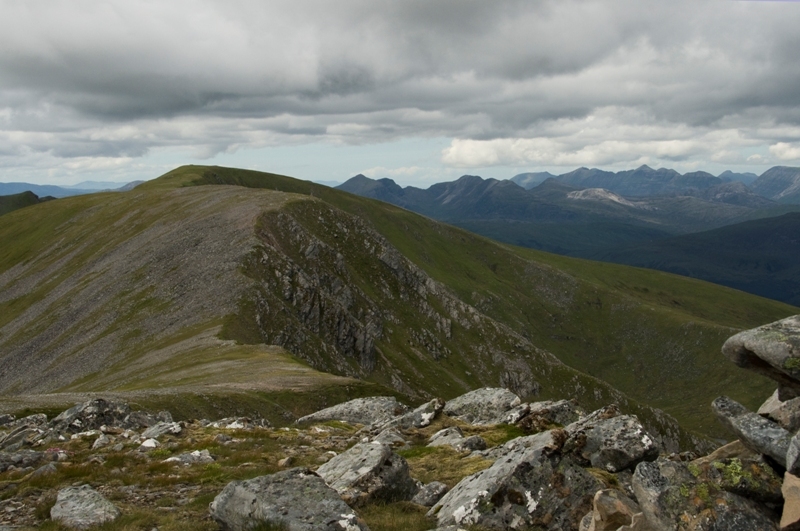 When descending to the north from the Sgurr Choinnich col, move to the right initially to avoid crags. A grassy slope then leads down into the corrie. There are more outcrops but ways can be found around them.